My brass band is looking at putting our band library catalogue into a database, but we haven't been able to find any software designed for this purpose. We'd like to store not only information about the pieces (composer, arranger, date, length, difficulty), but also information about the parts: which parts are supposed to exist, how many of each part we have, the date it was last checked. We'd like to be able to search the database by piece name, composer, and arranger; but also browse a list, filtering it by whether our training band could play it, or whether we have enough parts. Ideally, we'd also be able to store the playing history for each piece (so we can avoid playing the same piece at the same event) and 'tag' each piece with its style (jazz, march, &c.) and suitability for special events (Christmas, bandstand, church service, &c.). Given the value of these data and how hard it would be to replace it, we'd rather not trust it to some "cloud" provider unless we can be sure we'll always be able to get the data back out of it. Does this software exist, or would we have to hack it together ourselves using a generic database package? FileMaker is the industry standard. The cheapest version is $300, and it's way overpowered for what you need, but if you want the standard solution, here it is. OpenOffice contains a database editor, and is free (open source, even). From my experience with it, this won't be the prettiest catalogue when you're done, but it'll work. All of these products are built to manage your data and have excellent export capabilities, so no worries there--if you don't like your first choice, you won't be "locked in". Good luck! Based on your description, what your needs are, are very simple. You should be able to build your own with a simple database like Microsoft Access. At its simplest, your description could be just one table. Further, instead of a single table you could start with a single spreadsheet, like Microsoft Excel. That would get you started and let you further develop your ideas for what your really need. Not a bad way to start even bigger computer projects. Having said that, and as a computer professional, I could tell you there are a lot of reasons you should not do that. But its still a good way to start. This is really a database problem, so there are some advantages to starting with Access. For example, rather than putting a composer into several records, where his name could be spelled differently on each record, you could make a Composer table and list each composer's name once, then just refer to it from your main catalogue table. So, if you start with just one table you can add tables as you define the database. 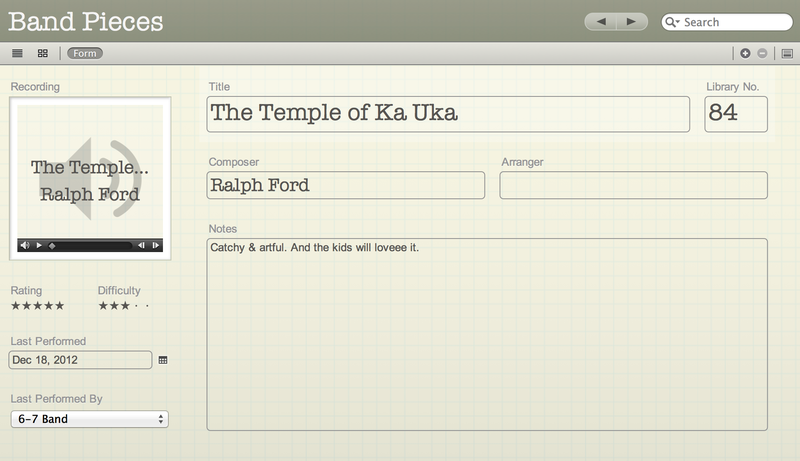 Access will also let you create a form to enter the data and provide lookups of composers and other information. They system can grow with you. I think its good to be involved because the system will become what you need it to do. It doesn't sound like you really need more than that. The most flexible solution is likely to be a generic database app like FileMaker. This would allow you to create any fields you need and search on them any way you like. An out of the box solution will likely not have all the features you want. I found this company, RCI http://riden.com/index.shtml but their webpage doesn't inspire confidence in me, although it seems many people use their software. If you don't want to pay the $300 for FileMaker, writing your own app is the way to go. More time intensive, but free, rewarding, and obviously will meet your exact specs. Not the answer you're looking for? Browse other questions tagged software sheet-music or ask your own question. Is there software to copy existing music sheet? Why does software-synthesized MIDI music sound so bad? Audio recording software for Chromebook laptop? Does piano tuning software actually work?